A Late night in December, it was the 18th into the early morning of the 19th, our family walked into the unknown. We walked into the hospital having no idea that our lives would be changed forever. Emily had clinic on Wednesday to check counts... Her platelets have been remaining stable which is great. This time was the first time in a long time we have seen them over 35! While still low, they are 40, but is great because most trials ask for platelets to be at 50! Her hemoglobin did take a bit of a drop from last week to 9.8 so we are hoping that goes back up! She did wake us up Tuesday night complaint that her right ear hurts pretty bad, enough to get Tylenol. During clinic, they looked at it and she has an ear infection, thankfully no fever accompanies that infection. But she is on antibiotics to clear it up. Emily got to spend the day with her dad most of the day today at school. Dad joined The WatchDog Program through Emilys school, so she was so excited. They Got to take a picture together after morning announcements, Emily just lived having her dad there all day and dad loved watching her all day. He enjoyed reading her writing journal, painting with her, lunch with her and just enjoying the day!! (Picture above) Winter break starts as school ends tomorrow. Emily is excited, because they have pajama day tomorrow and her friend Lilly's mom made her pajamas, so she is excited to hang in Jammie's for the day on the last day of school before winter break. Saturday our PA friends, Sue and Jojo are coming into town until Monday morning, to spending a little time with them. We look forward to them coming. Sunday Emily has her ASK Childhood Cancer (the clinic) Christmas party and she us excited for that. She was looking a bit pale to tonight, so hopefully that isn't an indication that her hemoglobin dropped anymore and that she us just tired after a long day. Round 12 of the avastin trial will start on December 26th, it is the last and final round of this regimen. We have exhausted efforts with this trial, and must find something to move forward with. Dr Sholler has emailed Chrystal Luis about her trial in Texas, so we will see. We continue to be ever so thankful of all the wonderful people out there being apart of our journey and loving our family. Your Christmas cards, the bandaids, your donations, your gifts mean more than you could imagine and we thank you! Thank you. 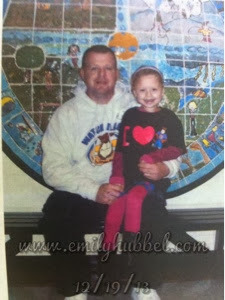 You may still help out through Emilys page, www.emilyhubbel.com, or the gofundme at www.gofundme.com/emilysjourney. Please make sure you hug your kids and tell them how much you love them. 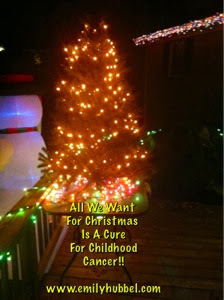 Continue to spread the awareness of childhood cancer!